Castor prices traded almost flat on the back of good demand and sufficient supply. 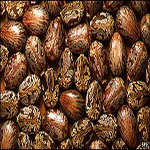 There was good demand from exporters of castor oil on which crushers bought heavily. According to SEA data, during April-February 2015-16, castor oil export increased to 4.34 lakh tonnes as against 4 lakh tonnes in corresponding period last year. This entry was posted in Castor - India, Castor Prices and tagged castor market, castor prices by Gayathri. Bookmark the permalink.